It's always bittersweet after the final performance. Everyone involved is flooded with the feeling of a job well done. But you also realize that another chapter in your life is complete and you may never have this experience with these people ever again. That's what the cast and crew of Cyrano feels now after a great three show run the weekend of March 27, 28 and 29. So let's just revel in the great performances that took place on the stage of the Royal Oak High School Auditorium and know that everyone who came to see Cyrano was part of the show, the experience, the moment!. Because without the audience, the theater is just a stage. Thank you everyone who came out and saw the show, and especially to all of the hard working parents, teachers, coaches, volunteers and to our directors. We will never be able to thank you enough. Here's looking forward to the One Acts and our 2015-16 season!!! We are not jumping the gun here. Now that the cast has been announced, we need an audience to perform to! Do your part and become an audience member today. Tickets at the door!!! Purchase a Cyrano Program Ad or Dedication!! What is the best way to support the Drama Club, your Business or your Student member? By purchasing an advertisement for your business or a dedication to support your favorite Drama Club Member! Click here to download the forms and pay via Pay Pal. It's too easy not to do it!! Buy AN Ad or Dedication NOW! Order your Cyrano T-Shirt Now! 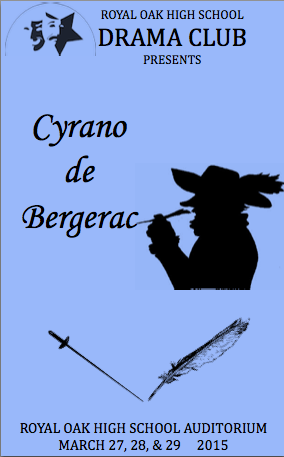 The Cyrano T-Shirt Design has been chosen and we will have Red T-shirts and Black T-Shirts with White Print. You can get short sleeve, long sleeve, crew neck or hoodies. 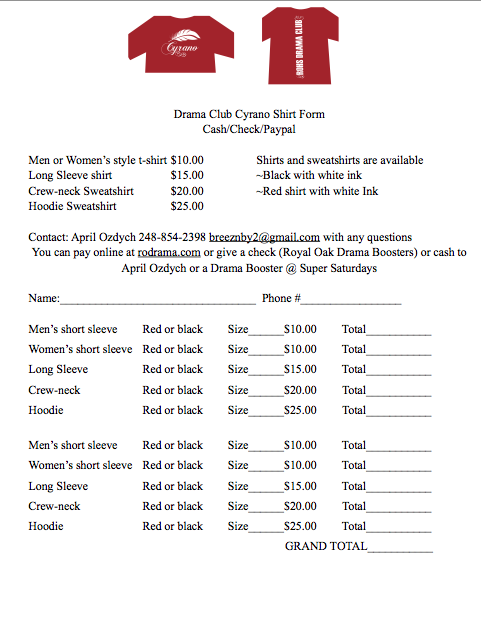 Just click the order form to download, choose your style size and color and give it to April Ozdych on Super Saturdays with cash or a check made out to Royal Oak High School Drama Boosters. Contact April Ozdych at 248-854-2398 or at breeznby2@gmail.com for more info. You can also order and pay right here by clicking the button below. We have two forms for members to fill out. Cast and Crew, please provide the information you want included in the Cyrano Program. Parents/Students, we are surveying the talents we have available and would like to know how to get in touch with you and how you may be able to help. Just click on the appropriate link, fill out the form and we will be in touch! Congratulations to those got a cast part in Cyrano! 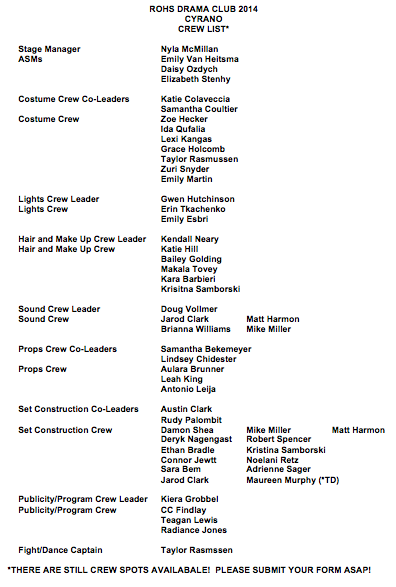 If you didn't get your part, there is so many aspects to help with (be a crew member) and still be part of the production! Click to download the PDF for printing. You must learn to speak like a Frenchman. Learn your accent here!! Using a walking stick or a fan on stage? Click here to find out how to use them.